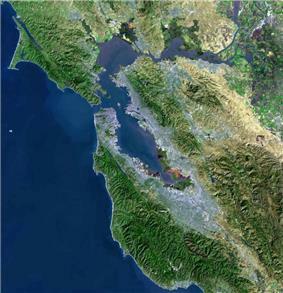 Archaeological evidence suggests the San Francisco Bay Area has been inhabited as early as 2700 BC People of the Ohlone language group occupied Northern California from at least the 6th century. Though their territory had been claimed by Spain since the early 16th century, they would have relatively little contact with Europeans until 1769, when, as part of an effort to colonize Alta California, an exploration party led by Don Gaspar de Portolà learned of the existence of San Francisco Bay. Seven years later, in 1776, an expedition led by Juan Bautista de Anza selected the site for the Presidio of San Francisco, which Jose Joaquin Moraga would soon establish. 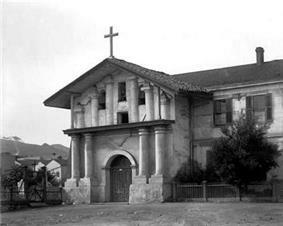 Later the same year, the Franciscan missionary Francisco Palóu founded the Mission San Francisco de Asís (Mission Dolores). As part of the founding, the priests claimed the land south of the mission for sixteen miles for raising crops and for fodder for cattle and sheep. In 1778, the priests and soldiers marked out a trail to connect San Francisco to the rest of California. At the top of Mission Hill, the priests named the gap between San Bruno Mountain and the hills on the coast La Portezuela ("The Little Door"). 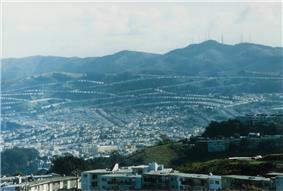 La Portezuela was later referred to as Daly's Hill, the Center of Daly City, and is now called Top of the Hill. During Spanish rule, the area between San Bruno Mountain and the Pacific remained uninhabited. Upon independence from Spain, prominent Mexican citizens were granted land parcels to establish large ranches, three of which covered areas now in Daly City and Colma. Rancho Buri Buri was granted to Jose Sanchez in 1835 and covered 14,639 acres (59.24 km2) including parts of modern-day Colma, Burlingame, San Bruno, South San Francisco, and Millbrae. Rancho Laguna de la Merced was 2,219 acres (8.98 km2) acres and covered the area around a lake of the same name. The third ranch covering parts of the Daly City-Colma area was named Rancho Canada de Guadalupe la Visitacion y Rodeo Viejo and stretched from the Visitacion Valley area in San Francisco, to the city of South San Francisco covering 5,473 acres (22.15 km2). Following the Mexican Cession of California at the end of the Mexican–American War the owners of Rancho Laguna de La Merced tried to claim land between San Bruno Mountain and Lake Merced. An 1853 US government survey declared that the contested area was in fact government property and could be acquired by private citizens. There was a brief land rush as settlers, mainly Irish established ranches in farms in parts of what is now the neighborhoods of Westlake, Serramonte, and the cities of Colma and Pacifica. A decade later, several families left as increase in the fog density killed grain and potato crops. The few remaining families switched to dairy and cattle farming as a more profitable enterprise. In the late 19th century as San Francisco grew and San Mateo County was established, Daly City also gradually grew including homes and schools along the lines for the Southern Pacific railroad. Daly City served as a location where San Franciscans would cross over county lines to gamble and fight. As tensions built in approach to the American Civil War, California was divided between pro-slavery, and Free Soil advocates. Two of the main figures in the debate were US Senator David C. Broderick, a Free Soil advocate and David S. Terry who was in favor of extension of slavery into California. Quarreling and political fighting between the two eventually led to a duel in the Lake Merced area at which Terry mortally wounded Broderick, who would die three days later. The site of the duel is marked with two granite shafts were the men stood, and designated is California Historical Landmark number 19. As some of the refugees established homes in the area, the need for city services grew. This, combined with the fear of annexation by San Francisco and being ignored by San Mateo County, whose seat far to the south left residents feeling ignored, created a demand for incorporation. The first such attempt was proposed in 1908 for incorporation as the city of Vista Grande. Vista Grande would have spanned from the Pacific to the Bay, with San Francisco as its northern border and South San Francisco and the old Rancho Buri Buri as its southern border. The proposal was rejected over the scope of the planned city, which was too broad for many residents. The initial proposal also revealed rifts in the community among the various regions, including the area around the cemeteries, who were excluded from further plans of incorporation. On January 16, 1911 an incorporation committee filed a petition with San Mateo County supervisors to incorporate the City of Daly City. The city would run from San Francisco along the San Bruno Hills until Price and School streets with San Francisco and west to the summit of the San Bruno Hills. The city would have an estimated population of 2,900. On March 18, 1911 a special election was held, with incorporation narrowly succeeding by a vote of 132 to 130. 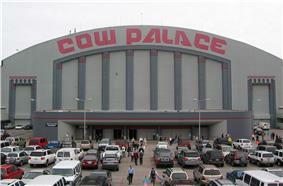 It remained a relatively small community until the late 1940s, when developer  The Cow Palace, located in Bayshore and now within the city limits of Daly City, was the site of the 1964 Republican National Convention. 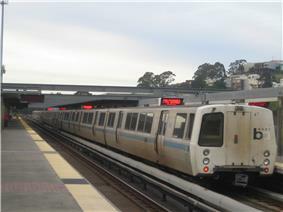 The Daly City BART station opened on September 11, 1972, providing northern San Mateo County with rail service to downtown San Francisco and other parts of the Bay Area. The line was extended south to Colma in 1996 and then to Millbrae and the San Francisco International Airport in 2003. On New Years Eve, 1978-New Years Day, 1979, The Runaways performed their last concert ever at the Cow Palace before breaking up in April. In October 1984 Taiwanese American writer Chiang Nan was assassinated, allegedly by Kuomintang agents. Neighborhoods of Daly City include  Bayshore remains somewhat disconnected from the rest of Daly City; to drive from Bayshore to any other part of Daly City, one must drive through San Francisco via Geneva Avenue or through unincorporated San Mateo County via Guadalupe Canyon Parkway. Several Daly City neighborhoods, such as Crocker, Southern Hills, and Bayshore, share a street grid and similar characteristics with adjacent San Francisco neighborhoods, such as Crocker-Amazon and Visitacion Valley. Several golf courses are located within or straddle the border with San Francisco. The Olympic Club is designated to host the USGA U.S. Open in 2012, hosting the U.S. Open four times previously. The private San Francisco Golf Club and Lake Merced Golf Club have part or all of their course in Daly City. In the California State Legislature, Daly City is in the 11th Senate District, represented by Democrat Mark Leno, and in the 19th Assembly District, represented by Democrat Phil Ting. In the United States House of Representatives, Daly City is in California's 14th congressional district, represented by Democrat Jackie Speier. There are several public school districts in Daly City. The biggest are the Jefferson Elementary School District and Jefferson Union High School District, both of which are headquartered in the city. In addition, there is the Bayshore Elementary School District (2 schools), Brisbane School District (Panorama School in Daly City), and South San Francisco Unified School District (2 schools in Daly City). Daly City has two high schools: Westmoor High School and Jefferson High School, plus a continuation school, Thornton High School. Daly City is also home to two Catholic parochial schools: Our Lady of Perpetual Help on Top-Of-The-Hill and Our Lady of Mercy in Westlake. John Madden, NFL player, Hall of Fame coach and sportscaster, graduated from Jefferson High School in 1954. ^ a b "City of Daly City". ^ a b "Daly City (city) QuickFacts". ^ "North American Numbering Plan Letter" (PDF) (Press release). Bellcore. 1996-11-22. Retrieved 2009-06-26. ^ Levy, Richard (1978). "Costanoan". In William C. Sturtevant and Robert F. Heizer. ^ "Visitors: San Francisco Historical Information". City and County of San Francisco. Archived from the original on Mar 31, 2008. Retrieved June 10, 2008. ^ a b c "Mexican Land Grants / Ranchos San Mateo County". Earth Sciences & Map Library University of California, Berkeley. ^ "San Mateo". Office of Historic State Preservation California State Parks. 2009. Retrieved 2009-07-05. NO. 19 BRODERICK-TERRY DUELING PLACE ... The site is marked with a monument and granite shafts where the two men stood. ^ "Historic Earthquakes - 1957 March 22 19:44:21 UTC Magnitude 5.3". Earthquake Hazards Program. ^ Bishop, Katherine (1988-03-09). "California Jury Is Told Defendant Admitted Slaying Journalist". The New York Times. Retrieved 2007-11-13. ^ Commission on Disabilities | San Mateo Health System. Smco-cod.org. Retrieved on 2013-07-21. ^ "Daly City city, California - Fact Sheet - American FactFinder". 2000 Census. ^ Grand National Rodeo. Grand National Rodeo. Retrieved on 2013-07-21. ^ California City and County Sales and Use Tax Rates - Cities, Counties and Tax Rates - California State Board of Equalization. Boe.ca.gov (2013-06-17). Retrieved on 2013-07-21. ^ jeffalumni.com. jeffalumni.com. Retrieved on 2013-07-21. Chandler, Samuel (September 1973). Gateway to the Peninsula. Daly City: City of Daly City. Gillespie, Bunny (2003). Daly City. Images of America. Charleston, South Carolina: Arcadia Publishing. Keil, Rob (2006). Little Boxes: The Architecture of a Classic Midcentury Suburb. Daly City, Cal. : Advection Media. ISBN 0-9779236-4-9. Vergara, Benito M., Jr. (2009). Pinoy Capital: The Filipino Nation in Daly City. Asian American History and Culture. Philadelphia: Temple University Press.